The 3D printed jewelry is one of trending industries that come as a result of mixing between both jewelry design industry and the new revolution of 3D printing. 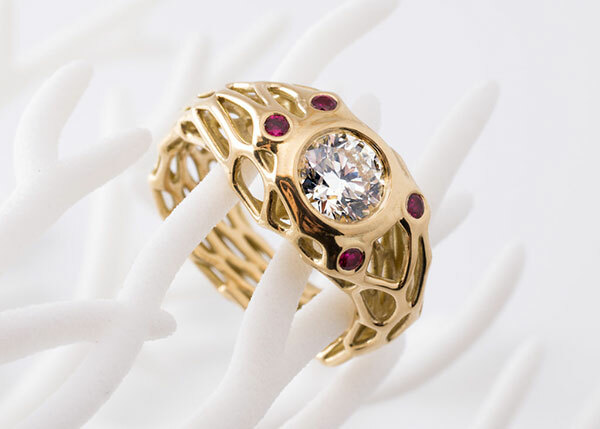 Instead of the traditional jewelry manufacturing process that requires experience and phases, designers are now able to turn their jewelry ideas into real products by simply using a CAD modeling application and an affordable 3D printer. 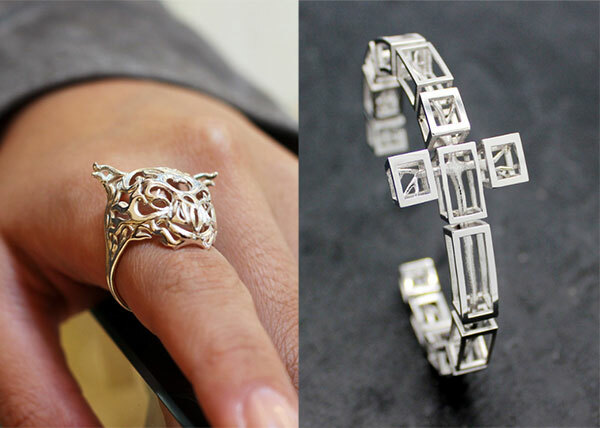 During the last few years, the 3D printed jewelry business is revolving rapidly and today we can see 3D printed rings, bracelet, and necklace collections are featured in world jewelry exhibitions and galleries. Although there are still some obstacles related to the 3D printing industry, the current technology status can provide an opportunity for designers to achieve success in the market by 3D printing jewelry and introduce new design ideas to their consumers. The flexible nature of the technology helps designers to innovate and merge between ideas and technologies to expand their presence in the market. 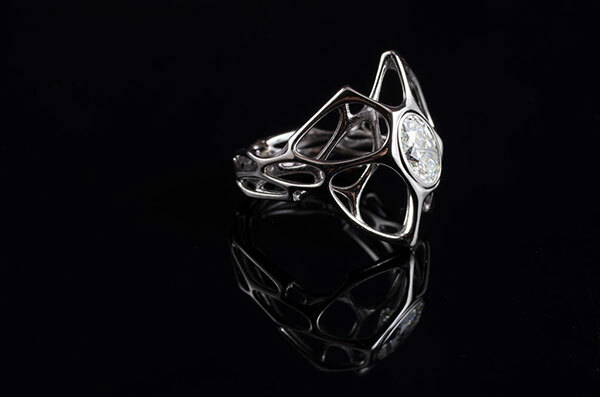 The 3D technology is still new in the jewelry design industry, yet it can shift the industry to a different direction or at least create a new trend in the jewelry design that can help designers to design and 3D print jewelry while eliminating the middle steps including the prototyping and modeling that requires experience, time, and cost as mentioned earlier. 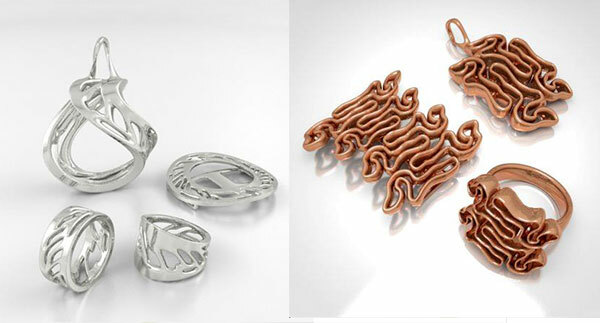 Although part of the traditional process is required when 3D printing jewelry with materials such as gold and silver as we will explore later, many designers are targeting cheap and easy to form 3D print materials such as ABS and PLA. As designers can implement 3D modeling application to create their 3D jewelry models, it becomes easier to design with freedom without restrictions related to the process or the materials. They design the jewelry model, customize it based on the client’s needs and 3D print the jewelry piece directly. This reduces the production cycle, and the ability to quickly customize the jewelry based on the consumer needs add a business value of the 3D printed jewelry business and opens new opportunity for designers. Additionally, the 3D printing technology opens the door for new materials to be adopted in the manufacturing process either by using the 3D printing technology alone or blending it with the traditional manufacturing process. These materials can include plastics, ceramic, steel, and others. Although there are barriers in the 3D printing industry such as the cost of the material and limitation when it comes to mass production, it can be still considered an opportunity for designers to explore this business and achieve market individuality by introducing new designs and collections as we will explore in the successful examples below. During the last couple of years, many jewelry designers have started to introduce 3D printed jewelry as part of their collections and others have shifted completely to the 3D printed jewelry. Recently, the 3D printers’ maker, Formlabs, has introduced a complete guide for Selling Custom Jewelry with 3D Printing to provide a step by step guide for designers who would like to join the 3D printed jewelry revolution. One of the leading examples in the 3D printed jewelry is Nervous System. A company that was founded in 2007 as a design studio by Jessica Rosenkrantz and Jesse Louis-Rosenberg. 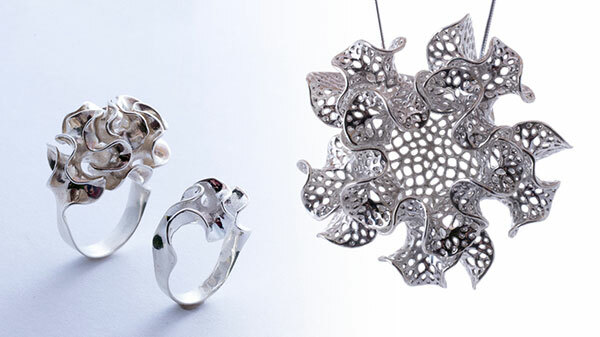 The studio which is located in Massachusetts provides a mix between science, simulation, and 3D printing to create nature-driven jewelry designs. Each jewelry piece is a simulation for the organic form such as flowers and nervous system. Their collection includes more than 24 jewelry designs that are based on the same approach and can be explored in their Nervous Systems main website. Another successful example is Vulcan Jewelry, a designs studio by Desmond Chan to provide 3D printed jewelry using the 3D printing technology and rapid prototyping. Chan’s collection tends to provide new experience with jewelry design such as moving rings that include ruby spheres and move while wearing it. Another designer who started to provide 3D printed jewelry on his website is Peter Donders, a 3D designer and modeler. His website includes large number of 3D printed design ideas including jewelry design collections. 3D printed jewelry collection by Vulcan design studio. There is an increasing number of designers who see the 3D printed jewelry design industry is a successful business model. Some companies started to offer the 3D print models for jewelry to download and print such as Shapeways and other companies started to develop 3D modeling applications for jewelry designers such as RhinoGold and Tinkercard. 3D printed collection by Peter Donders. One of the advantages of the 3D printing technology is the flexibility as designers can depend on it to create the 3D printed jewelry or blend it with traditional technologies as mentioned earlier. Majority of the 3D printed jewelry pieces are printed using precious materials such as gold silver or bronze, copper, and brass. In order to print with this material, designers either need an expensive 3D printer or use the technology along with the traditional manufacturing methods such as lost-wax printing and casting. In this process, the 3D design is created using CAD modeling applications and 3D printed using wax-like resin as a printed material. Then, one or more wax sprues is added to the model, which is attached by the sprue to a wax tree with the models. The tree is covered by a fine plastic and used to form the mold that us used for casting the metal. Then, the plastic mold is put in the oven and heated for several hours until the wax is completely burned out. By using this method, the jewelry manufacturing becomes more cost effective and allows to reach professional results such as the smooth surface produced using this method. Also, it helps designers to take advantage of the 3D printing technology as the 3D files can be easily modified and improved from one version to another. Also, it helps them to add more details to the design that was not available or hard to achieve with the traditional methods. The 3D printed jewelry is taking the industry to a new level by opening more opportunities of designers to start their own jewelry design collection without worrying about the production or the design process. Now, designer can create their own collections and make it available for sale online similar to the examples mentioned above.